UNU-MERIT » World Day Against Child Labour: How Many Have to Work? World Day Against Child Labour: How Many Have to Work? UNICEF’s latest report on the ‘State of the World’s Children’ says there are 150 million 5-to-17-year-olds caught up in the world of work. 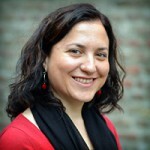 Ahead of ‘World Day Against Child Labour‘, 12 June, Dr. Sepideh Yousefzadeh looks at the essential context with a case study from Iran. I walk on the streets of Tehran after five years away, this time with my daughter. Everything is different. Tehran is more relaxed, peaceful and happy. The municipality is doing a great job in providing green spaces all over the city. The main highways are designed with modern monuments and the city is filled with towers and tall buildings. Tehran is friendly again. Since the 1990s the municipality has invested a lot in the poorer neighborhoods, particularly with projects for youth and children. Playgrounds, green spaces, cultural centres and parks with sports equipment have transformed the once bare streets of poor neighbourhoods. Whether or not they are put to good use is a different story, but the impoverished southern neighbourhoods, or ‘jonoob-e shaher’, have certainly changed. I have to pass by those poorer neighbourhoods en route to the main cemetery — which also shocks me. The cemetery has grown so large that it now covers ground across the main road. What has not changed is the presence of little street vendors, selling flowers around the cemetery. Small children line up with bouquets of various colours and kinds, selling to people for the graves of their loved ones. Coming back from the cemetery, we see children at the red light selling narcissi — a big bunch for the equivalent of a couple of euros. My sister is driving us home. She points at one of the boys and asks if I recognise him. He was a child when we first saw him. After five years the same street children are teenagers now — and still plying the same trade. It is difficult – almost impossible – to know how many children are engaged in labour worldwide. In many countries there are simply no national reports or data available on the issue of child labour. Another problem is that the definition of a ‘child’ or ‘child labour’ at the national level may not be in line with international definitions set out by UNICEF and the ILO. And then, even if the national definition were consistent with those of international ones, the household itself may not count the work done by children as labour. From a child rights perspective, child labour as a discourse is often linked to education and protection. Yet if the aim of research into child labour is to guide public policies, we also need to examine the context, including the household. A comprehensive and effective rights-based approach has to engage parents’ rights and entitlements at different levels while also examining child labour. Policies can only influence child labour effectively if they target the household as well as the working child. The capabilities of a household (e.g. employment, education and health) and the choices parents make to utilise those resources are important factors for addressing the root causes of child labour. In other words, children’s wellbeing is nested in their household’s wellbeing and they need to be studied and addressed in parallel. In my research on multidimensional child poverty (in Iran), I examined child labour as one of the dimensions of children’s deprivation, next to household multidimensional social exclusion. I was able to examine children’s deprivation (including child labour) in light of the socioeconomic status of the household. I defined child labour as “children who work and do not attend the school”. My results showed that in 2009 around 10% of children in Iran were caught up in the world of work: 18% in rural areas and 7% in urban areas. My study also revealed that living with extended and nuclear households increases the likelihood of child labour; in polygamous households and single families within extended households the probability of child labour decreases compared with children in single-headed households (all else being equal). 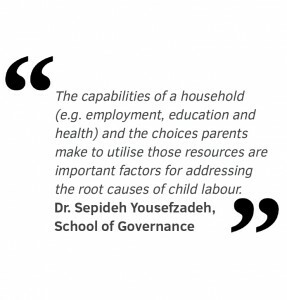 The difference between extended households and single parents within the extended households suggest that for single parents, living with other members of the extended family, is a protection mechanism against child labour. Additionally, the decreased likelihood of child labour in polygamous households compared with single-headed families suggests that despite the increased household size children are not pushed to work and contribute to the family’s income. Living with illiterate parents increases the relative risk of child labour but the effect is less if the child lives with at least one literate adult member. 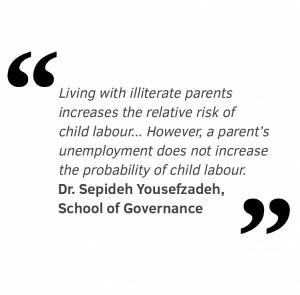 However, a parent’s unemployment does not increase the probability of child labour. So parents’ illiteracy is more detrimental for child deprivation than parents’ unemployment. This study could be instrumental for policymakers in Iran because the existing assessments and programmes (led by governments, UN and NGOs alike) on child labour in Iran are mainly focusing on the child itself. There are reports on child labour both at the national and local levels that study the wellbeing of the working child, his/her day-to-day life, working conditions, education, leisure, struggles and dreams. However, they do not provide information about the capabilities of the parents to direct social policies. A more detailed assessment of household’s capabilities and resources is therefore badly needed.